Soft Coated Wheaten Terrier Dogs - The Soft Coated Wheaten Terrier is a medium-sized terrier breed of dog. The Wheaten was originally bred in his native Ireland to be an all-purpose farm dog whose duties would have included herding, watching and guarding livestock, and vermin hunting. There are four coat varieties, Traditional Irish, Heavy Irish, English, and American. The coat of the Soft Coated Wheaten Terrier are considered to be hypoallergenic - a trait which makes them a good choice for allergic or asthmatic dog owners. Wheaten terriers are very sociable and quite active. Their temperament is curious and friendly. The Wheaten is a fun-loving, intelligent dog. It can be vocal, making it a good watch dog although no one should consider this breed to deter burglars as the dog will greet the burglar as a friend. Their temperament should be such that they consider a stranger a friend they have not met yet. The Soft Coated Wheaten Terrier is known to be less aggressive in nature than that of other terrier breeds. Wheatens are restrained and patient with children. This information is licensed under the GNU Free Documentation License. It uses material from the Soft-Coated Wheaten Terrier article on Wikipedia.org. 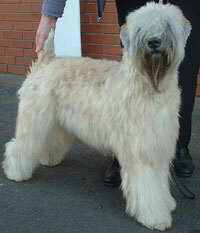 Soft Coated Wheaten Terrier Breeders - Advertise your kennel puppies and dogs here.